The Island of Mozambique is a former Portuguese trading-post on the route to India. The island was a major Arab port and boatbuilding centre long before Vasco da Gama visited in 1498. The Portuguese established a port and naval base as early as 1507, while the Chapel of Nossa Senhora de Baluarte, built in 1522, is considered the oldest European building in the southern hemisphere. Monsoon winds have been blowing traders from India to Ilha de Moçambique (Island of Mozambique) since the 10th century. In the early 1500s Vasco de Gama arrived in Ilha and built a Portuguese fort out of blocks of the coral reef surrounding the island, claiming the territory for his nation. After nearly 500 years of Portuguese rule, Mozambique gained its independence in 1975. The fort was used as a military barracks during Mozambique’s bloody civil war and later as a school. 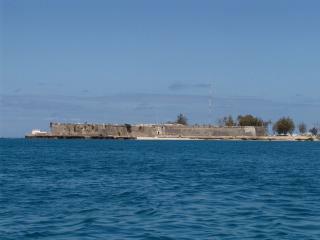 As the population on Ilha surged during the civil war, the fort fell into disrepair. Poverty-stricken Ilha residents searching for firewood found the window casings and wooden support beams of the fortress to be a cheap source of fuel. While wandering the streets of Ilha this August, we came upon a man using an axe to chip away at a large beam that clearly had come from the fortress. He reminded me that when people are hungry today, they can’t worry about preserving cultural treasures for tomorrow. Like its fort, Ilha itself is truly a unique place to visit. Although Ilha is less than three kilometers long, it has a population of over 14,000 people. Natural beauty and incomprehensible squalor coexist side-by-side on this tiny island. Most of the population on the island live in shanties made of sticks, straw, and the occasional piece of corrugated iron. While water is now piped onto the island, it is not sufficient to provide sanitation facilities to the island’s residents. Cholera outbreaks are common, while the beautiful beaches are used as bathrooms. Although the sanitation problem in the reed town prevents the island from being an ideal beach resort, there are many other reasons for exploring Ilha. At night the streets are pitch black, making star gazing from the middle of the road a fabulous experience (don't worry – there are very few cars on Ilha). Small museums offer a glimpse into the island’s colorful past. For example, the governor’s palace is furnished with beautiful carved furniture from Goa, India. Moreover, the natural beauty of the area is breathtaking. The teal and blues of the water are calm and inviting. You can hire a local boat to take you on a day of sailing around the coral reefs. Despite the island’s poverty, there are several very comfortable guest houses and small hotels that have reasonable rates. You will find they are equipped with modern conveniences like hot water and comfortable beds equipped with mosquito nets. Ilha’s many restaurants offer an interesting fusion of cuisine. Traditional Matapa (the green leaves of a staple tuber cooked with local cashew nuts), curries, fresh seafood, and Portuguese style dishes predominate. Pizza and French-inspired foods can be found as well,and fresh fruit is plentiful. If you are looking to contribute to the local economy by shopping, there are a few shops which sell unique handmade crafts and jewelry. Most markets are set up for locals and with creativity can be a great source of gifts. The morning market by the water is bustling with people selling vegetables, freshly harvested sea salt, palm frond brooms, fabric, and—if you need something to store all these items in—plastic containers from China. There are also shops where you can buy African print clothing: men’s lounge pants and long sleeve shirts as well as women’s “skorts” and dresses. While discovering Ilha, I learned that the government, realizing that the fort was an important part of Mozambique’s history, turned to the UN Educational, Scientific, and Cultural Organization (UNESCO) for help. In partnership with other United Nations organizations, UNESCO has been working with local authorities and contractors to restore the fort to its former state. This has been no small task - over the years, attempts to patch up problems resulted in faulty repairs that resulted in chunks of concrete breaking off of walls and ceilings. To ensure that local contractors are taught proper preservation techniques for this unique structure, UNESCO works almost exclusively with local contractors. UNESCO is also partnering with the United Nations Development program to ensure that preservation contributes to poverty reduction. Thus, the fort will not only be a tourist attraction, but will also be a venue for community gatherings as well as a source of clean drinking water for Ilha residents, thanks to the rehabilitation of the fort’s original 16th century rain water collection system. An island rich in culture and history, Ilha de Mozambique is a truly unique place; a place of pizza and curries, vibrant markets and soiled beaches, medieval architecture and shanty towns. For those that enjoy diversity and getting off the beaten path, Ilha is fabulous place to find yourself. I went to the island shortly after the war ended, so this review may be rather out of date. It was an unforgettable experience. I flew from Maputo to Nampula and drove in a battered taxi for three hours through the rain soaked jungle. It took three hours because of the huge craters from mines littering the road. I would say about 40% of the local people had injuries or were maimed from mines. The Island of Mozambique lies like a glittering pearl in an blue-green lagoon. It is reached via a single-track concrete pillared causeway built by the Portuguese in the sixties. During the war the population, migrating to the coast from inland, expanded from 3000 to 25000 in a few years, and the population continues to rise, placing unsustainable pressure on the scant resources of this tiny island. Water shortages are common, there is strepticocca all over the coral surrounding the island from unprocessed human effluent. This situation may well have improved since my visit, but the floods of a cuple of years ago cannot have improved the situation. The island itself is beyond comparison in the Indian Ocean. Zanzibar, Kilwa, Mombasa, even Lamu, cannot hold a candle to it in terms of historical importance, beauty, charm, variety... The 17th century Portuguese fort is magnificent, the baroque gateway carved from stone and white coral, and the old bronze cannon still there, rotting in their emplacements. The ancient chapel on the tip of the island being restored by a small team of dedicated craftsmen; the governors palace, a Visconti-esque fantasty of tattered damask curtains and Indo-Portuguese furniture; the fabulous Neo-classical Hospital, once the healthcare marvel of the Indian Ocean, now a decaying hulk; the old slave-huts and Admiralty, the fruit and spice market, the mosque, the beaches, the old colonial palaces and houses -all beautiful. I can't recommend it highly enough. Be careful what you drink; theres hardly anything to eat except lobsters and pineapples; its highly malarial there; negotiate your boat trips, including fuel, before you set off; there are marvellous beaches across the lagoon on the island with the lighthouse. Everyone should go there NOW, before it is restored and commercialised to death. This is bound to happen sooner or later - its just too good an opportunity to miss! Manueline style: "The Chapel of Nossa Senhora de Baluarte..... Built by the Portuguese in 1522, the chapel is considered to be the oldest European building in the southern hemisphere. It is also considered to be one of the finest examples of Manueline vaulted architecture in Mozambique." Country named after them: The Portuguese gained control of the Island known in Swahili as "Msumbiji" in the 16th century and the westernised name became "Ilha de Mo?ambique" (Bradt gives an alternative version that it might have been derived from "Moussa ben Mbiki" the sheikh in control when da Gama first landed). The Portuguese East African Empire developed as a string of the possessions along the coast which were called by their individual names within what was genrally known as "Portuguese East Africa" but at first lacked any significant cohesion. in the 19th Century actual control was given to companies such as the Companhia de Mo?ambique (whose head office was in Lorenzo Marques) and Companhia do Niassa. However such central political control as existed was exercised from the Ilha which became the de facto capital and hence its name became accepted as representing the overall name of the entire area claimed by Portugal - even though in the late 19th century the "capital" was officially moved south to the flourishing city of Lorenzo Marques. In 1951 the colonies were combined into a single overseas province under the name Mo?ambique as an integral part of Portugal and this name was carried forward into the post colonial era.